Drying summer flowers is one way of extending the season’s colorf into winter. You’ll find different methods of dehydrating blooms to preserve them. A simple technique is to hang a loosely tied bouquet upside down in a dark, cool location. Another is to dip the flowers in silica gel. For clematis, West Virginia University Extension Service recommends Borax, a brand name for sodium borate that’s available in the supermarket’s laundry aisle. Borax desiccates the flowers but lets them retain their shape and size. Gather clematis flowers in the middle of the day, says Texas A&M Extension. Around that time, they’re usually the driest they will be all day. Collect them by cutting 1-inch-long stems. Don’t pick outdoor flowers for drying if it is raining or if it has just rained. Mix 1 part Borax with 1 part cornmeal. This is your drying agent. Place a layer at least 1 inch thick of your drying agent on the bottom of a shoebox or similar cardboard box. Distribute it evenly. Create small raised beds in the Borax mix and place the flowers on them. Sprinkle the Borax-cornmeal mix on the petals until they’re covered. There’s no need to bury the stems. Don’t stack the clematis, but have only one layer of flowers per box. Remove the flowers from the box five days later. Insert your fingers under the raised beds and lift the flowers out of the mixture. This length of time is recommended by West Virginia University Extension, which says that if flowers sit in Borax too long, they harden and their petals drop. Gently blow the powder off the petals and make your dried-flower arrangement. 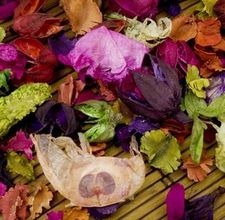 West Virginia University Extension suggests gluing the clematis petals to the flower stem before drying them. Clematis seed pods also dry well. Save the Borax-cornmeal mix. It’s reusable. Large clematis petals are difficult to dry. Choose flowers from small plant varieties.